Just back from NYC! 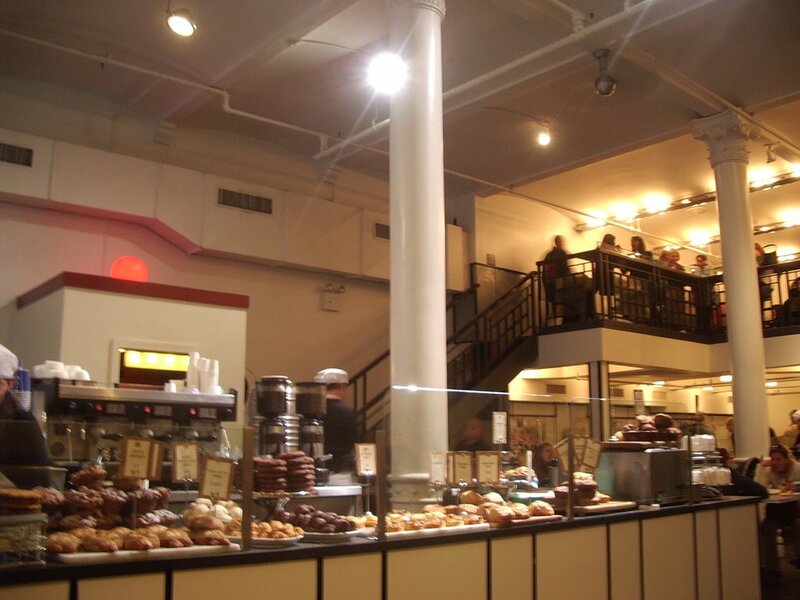 My post graduation plans were (and still are) to go to the Pastry program at the French Culinary Institute, but I’ve been applying for accounting/auditing jobs in NYC, “just in case.” Partly because the accounting field does interest me (it’s a lot more exciting than you would think!) and partly because I feel the need to justify my college education. And lo and behold I made it to the final rounds of interview for a few of the Big 4 accounting firms. One of the firms flew me over to NYC for final interviews this week and were kind enough to extend my stay for the weekend. I stayed with my lovely host Ingrid who has the hugest apartment in the bestest location ever, right on Bleecker & Broadway. What more could I ask for? The trip started off pretty blegh. First my flight from Ontario to Denver was cancelled due to a snowstorm. So I was rerouted to San Francisco where I had a two hour layover which delayed into a four, then five hour layer over before I flew from SF to JFK (instead of my initial destination of LaGuardia which is much closer). 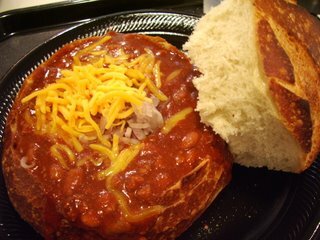 I kept myself entertained with a warm bowl of chili soup in a sourdough bread bowl from Boudin Bakery in the SF airport. Given the circumstances, I think I deserved a bowl of chili at 7am in the morning, hehe. I ate the entire thing, bread bowl cover and all, then realized the sheer quantity of how much bread I consumed. It’s very deceiving! I landed all ready to catch the Super Shuttle into the city but after a warning of a possible 90 minute wait before the next van, I opted for a taxi. 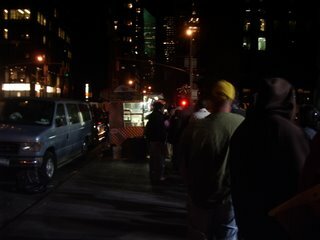 The line for the taxi took a good 30 minutes – there were SO MANY people, and not enough taxis, if you can believe that. I finally made it to the Sheraton around midnight, completely exhausted and HUNGRY. Haha, and get this. They couldn’t find my reservation. I almost had a heart attack. It turns out the firm booked it under my middle name. Whew. At least I made it! Ok, here starts the food part. I’m going to attempt to give you my entire trip in one post. Forgive me, it will be long! Coincidently, the Sheraton was located on 53rd & 7th Ave which happens to be just one avenue away from, “The Cart.” I’ve been following this thread on the Manhattan Chowhound Board for a while and given my perfect late night timing and ravenous appetite, I dropped my suitcases off in my room and dashed off to 53rd & 6th. “The Cart” has grown so popular that there’s event a website devoted to it. The wait was around 45 minutes (notice that my day thus far was full of long waits! 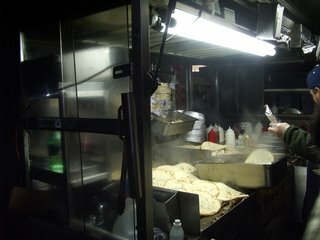 :)) but as I neared closer the smell of chicken, warm pita and gyros grew more and more inviting. I don’t know if I appreciated the smell or the warm heat emitting from the cart – it was so chilly that evening! I ordered the “Special – Combo Meat with White & Hot Sauce” ($5.00). Sounds mysterious, no? 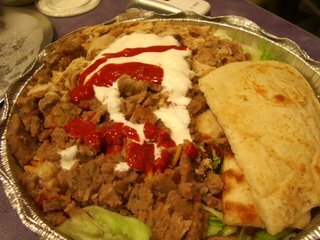 Lol, what you get is a huge metal tin half filled with a simple salad of lettuce and tomato, topped with warm pita bread. The other half is jammed packed with yellow basmati rice and a generous portion of grilled chicken and gyro meat. Moving in a very efficient manner, one man cooked, another packed in the rice & mean, and a third bagged the tin along with two containers each of white and hot sauce. It was quite satisfying, especially after a long a chilly day, but I don’t know if it was worth the long wait. The meat was very well seasoned, but the real magic is in the mix of the white and hot sauce. Each of the sauces are ordinary on it’s own – the white taste like a mix of mayo and cucumber sauce white the red is a simply flaming hot chili sauce. I mean HOT. So what I did was just dump both sauces over the meats (not before tasting the meats without the sauce beforehand, of course :)) and mix with the rice and all. So enjoyable! Spicy, creamy, salty and hot with the sauce with bind all the rice and meats components together. I used the pita triangles to scoop the it all up, and heck it tasted so much better that way, I just dumped my fork in the trash can! It was around 2:00am when I finished this and you know what? I wasn’t tired. It was as if I were REVIVED. But I needed to sleep because my interview was just 6 hours away at 8am. So I showered, blow dried my fair, ironed my clothes, called my parents, grandparents, aunt and uncle to ensure them of my safe arrival and forced myself to sleep. Dinner the next evening was at my absolute favorite restaurant in Chinatown, BoKy (Menupages says its “Bo Ky” but I SWEAR it’s “BoKy”). I’ve gone so often that they people know me there as the girl who always comes alone and who always has the wonton mein. And they always seat me at the same table. 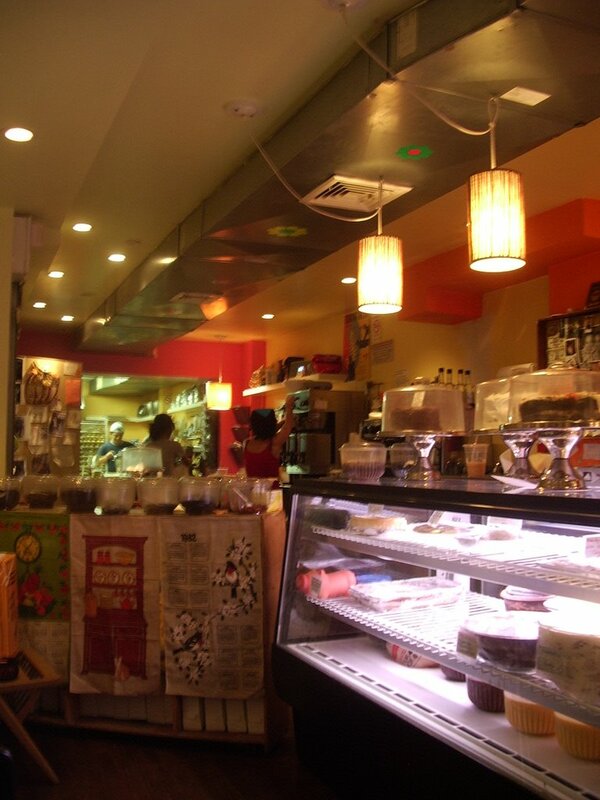 I used to come here on a biweekly basis while at NYU and it was my favorite place to be when I was homesick, tired, had a cold or just wanted to be by myself. 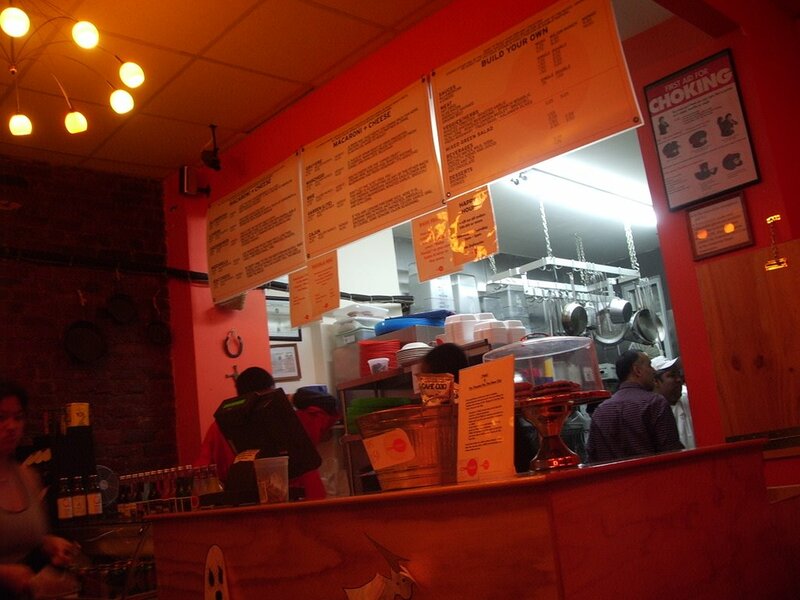 But tonight I wanted something more hearty, like Curry Chicken Funn…mmm! Oh man, this was amazing. 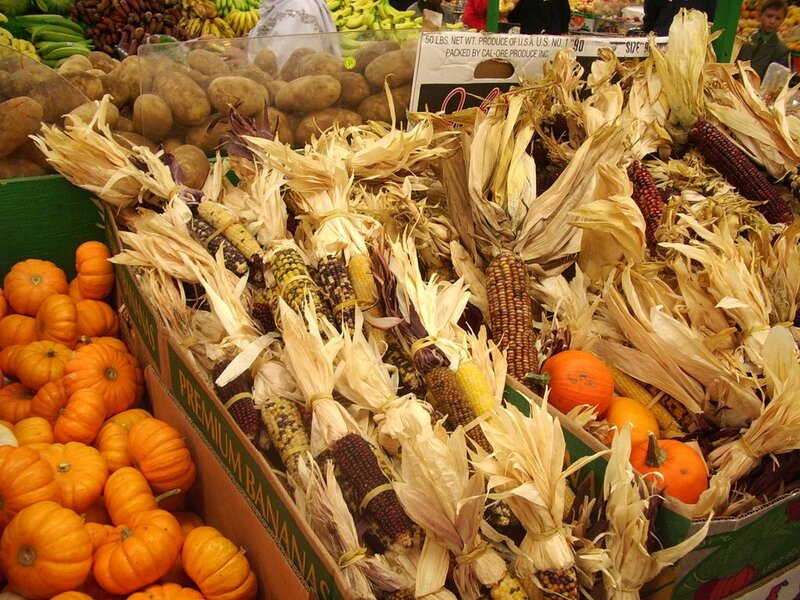 The weather has been nothing but windy cold and raining so I’ve been craving warm, filling winter foods. 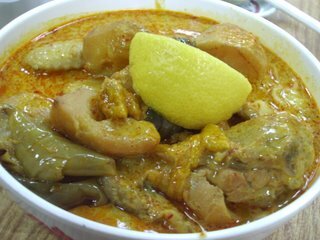 The yellow curry was thick and slightly spicy, poured over a bowl of boiled wide cuts of soft funn. The funn just soaped it all up and provided the perfect vehicle for the chili. Even better was when I topped it with a bit of BoKy’s signature chili sauce that is found on the condiment round at every table. It’s subtly spicy, very nutty sauce that seems to make everything taste a million times better than it was every meant to be. Oh I am so unworthy. Two large drumsticks and a chicken wing and chunks of potatoes round out this bowl of comfort. 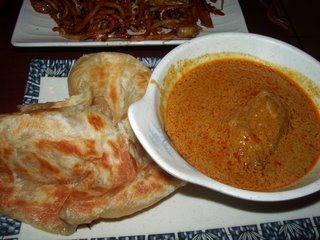 Jenny treated me out to lunch at New Malaysia the next day where we feasted on Roti Canai ($2.25), a hot fried bread served with a thick chicken curry. I love my curries! This was perhaps the best of the dishes we had. The bread was so addicting, hot stretchy with just a touch of salt and the perfect chew. As I college student without a meal plan, a car, or kitchen in LA I often resort to instant noodles more often than I would like. 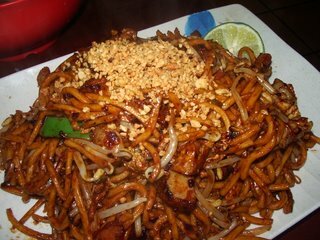 But I always go for the Korean Kimchee noodles, the Thai Mama Mein or the Indonesian Mee Goreng. But instant noodles is about as far as I’ve gone with Mee Goreng, so you must imagine it my surprise when it saw “Mee Goreng ($5.25)” offered as a menu item. This was very different from the instant noodles (well, what did I expect?!) in that the noodles were much thicker and fried with a ton of different vegetables and meats. They were all chopped up so small that most were unidentifiable, I don’t know if that should have made me suspicious…Jenny proposed the idea that maybe the cooks scooped up everything on the kitchen counter and dumped it in. Among the findings we made were bits of fish cake, tofu, onions, chicken, chili and eggs. There was also a whole lot more that we couldn’t quite identify! Flavor wise, it leaned on the greasy side but the well seasoned with a nice savory, slightly sweet and spicy balance. The noodles clung onto the shrimp and chili based sauce. I’ve had coconut milk based laksa lemak many times in the past, but rarely Asam Laksa. 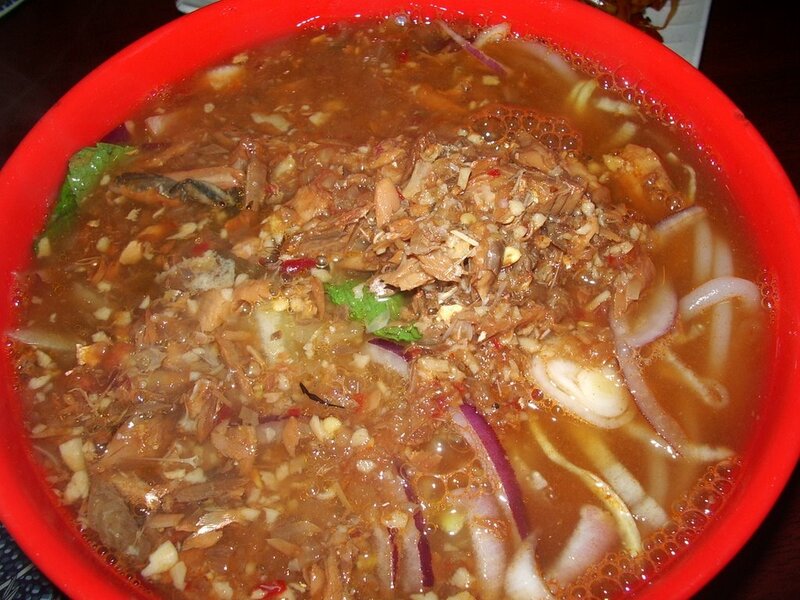 Priced at $5.25 this is the spicy and sour version in a lemongrass broth. The round noodles were thick, chewy and sticky, I’m not sure if I liked it very much. I don’t feel it paired well with the thin tangy broth finished with shredded chicken, onions and all the fish flakes you could ever desire. 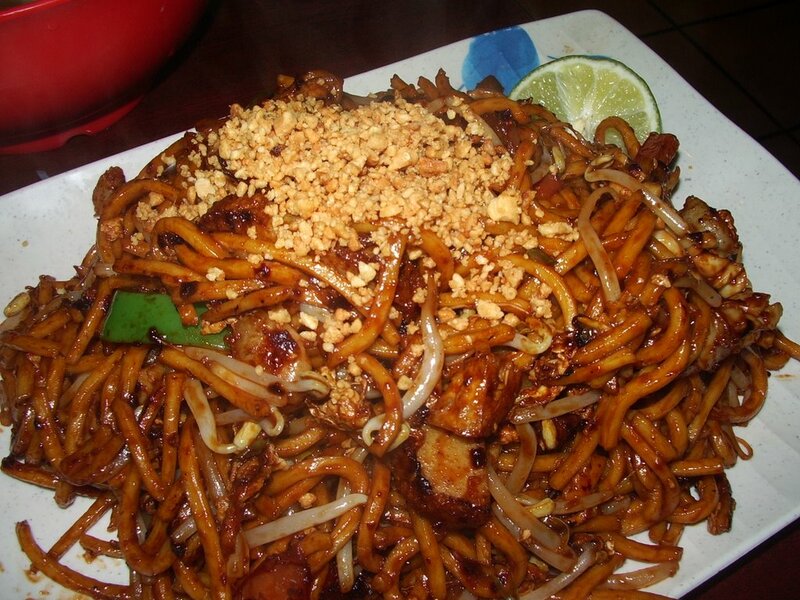 Now if a thick spicy peanutty sauce went over the noodles – I would definitely like to take part! We did lots of venturing around Chinatown and filled our afternoon with taro and lychee bobas, a massive freshly steamed mantou. There’s nothing in the world more satisfying that plain fresh hot bread! We also partook in a plain baked bao at Tai Pan (it’s a good thing Jenny and I both love plain bread – otherwise one would think the other was seriously insane and the rate we were eating!) We pondered buying chestnuts to roast in Jenny’s dorm kitchen, then decided we probably shouldn’t given that we have no idea how to roast chestnuts. We thought about steaming crabs (they were so delicious looking!) but then decided against that when we realized we didn’t have pots big enough. We people watched, people eavesdropped, people talked and pondered and dreamed about many things. 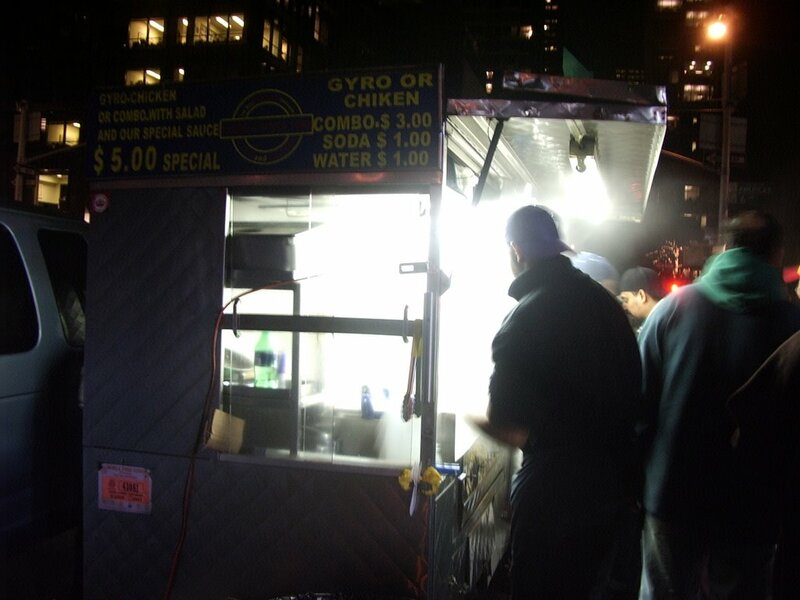 And ate very much on this windy cold New York day before we parted ways. It was the first time I’ve seen here in over two years! Going to Peanut Butter & Co. was the most financially unwise decision I made during this stay. I would tell you the real reason I went, but that would be embarrassing, so I will keep that to myself. 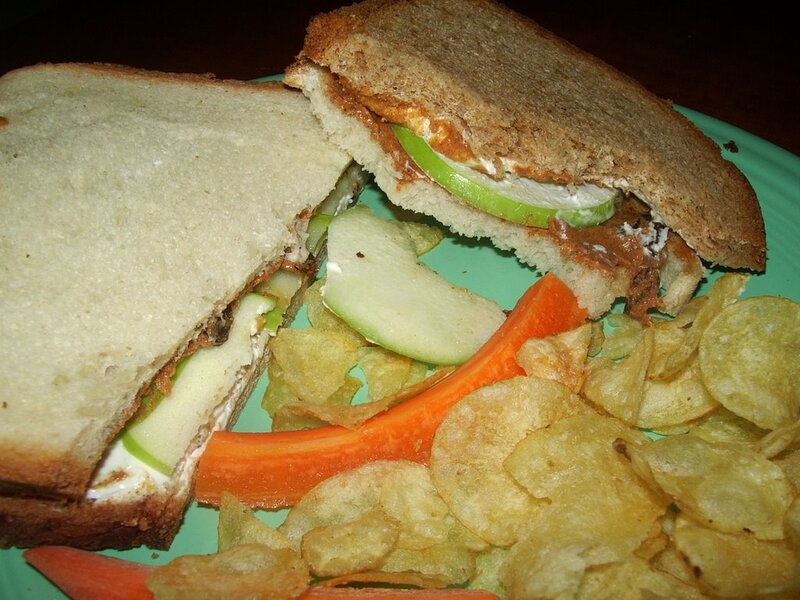 Just keep in mind that no one should ever pay $7.50 for a peanut butter sandwich. Even if it is made with cinnamon raisin peanut butter and filled with slices of tart green apples and tons of vanilla cream cheese. For dessert I walked over to Rocco’s further down on Bleecker Street. I was debating between Magnolia’s banana pudding or a cannoli at Rocco’s, but weather conditions prevented me from walking any further than absolutely necessary. I got takeout and brought it back to Starbucks where I enjoyed this treat along with my Chinese homework. It took the (cute) counter guy a good five minutes to package and wrap up my purchase, which only cost $2.50. I wonder if they lost money on my sale… Want to see what’s inside? Nope, not a cannoli! I was swayed at the last minute by a luscious looking French Lulu. Even the name is beautiful. It’s describe as “A Light Pastry Shell Filled With A Vanilla French Cream and Topped With a Macaroon Crunch,” and that’s precisely what it is. 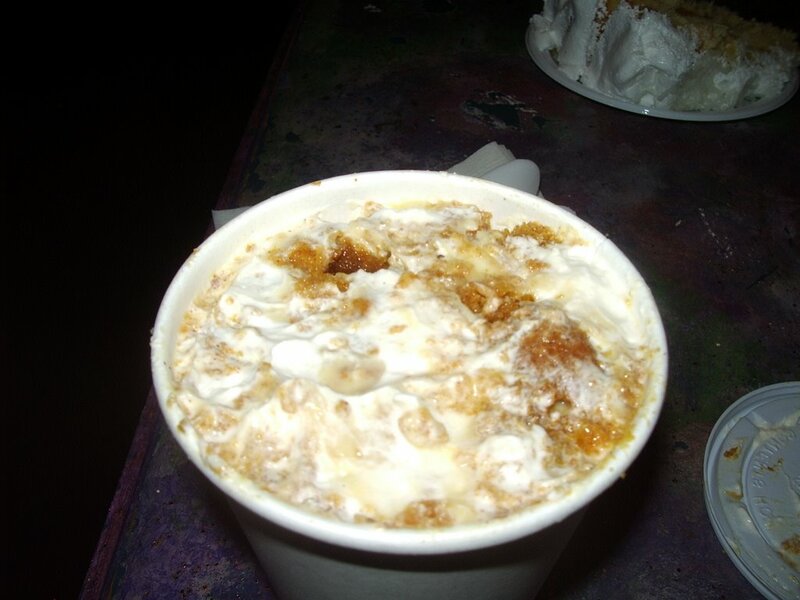 The cream was wonderfully rich and thick, only a tad sweet and flavored mostly by bites laced with chunky bits of crushed macaroon cookies. The sheet was similar to that of a Japanese cream puff, though a touch heavier and much more flaky. The guy put so much work into folding the pastry box that the decided to keep it. The empty box traveled with me all the way back to lovely ol’ Claremont. I almost forgot that Daylight Savings took place Sunday morning and was thus much grateful for the extra hour which I spent wandering aimlessly around the city. Growing up in Hawaii, I never knew Daylight Savings existed until I moved to NYC. And it still doesn’t make sense to me. It just adds more unnecessary confusion to our already flustered, full and delicious lives. Perhaps one day I’ll get it. 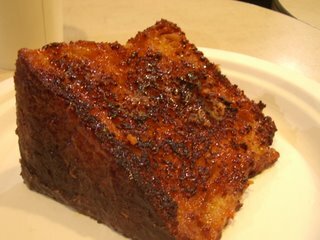 Brunch of the hugest French Toast at City Bakery on 18th St. Some people come for the pudding thick hot chocolate (which I also had) but I was hankering for their French Toast. It’s the most money I’ve paid for a single slice of toast ($6.50), but it is HUGE and a better deal than a $7.50 peanut butter sandwich. At least in my books. It is also very filling. The massive chunk is essentially dripped in an egg batter and grilled and caramelized. It’s a good excuse to have dessert during breakfast. The bread is a yeasty yellow creation, I suspect it may be challah, and the large proportion of hot bread is a good match for the thick layer of caramelized crust. It’s not a custardy type of French toast but a good two inches of fluffy goodness paired with crunchy caramel shell. Throw in a $4.50 cup of hot chocolate and you’re all set for a most wonderful sugar coma. Unless your name is Kathy and you decide that a midday break of banana pudding at Sugar Sweet Sunshine is well deserved. One of the problems I battle with is that once I get a food craving in mind it never ever goes away until I get that one food item. Hence, the need for the banana pudding I never got last night. I walked over to Sugar Sweet Sunshine instead of Magnolia (closer) because 1) the people are nicer 2) their cupcakes frosting is more fluffy and sugary 3) they really pack in the banana pudding into the 12 oz. “small” cups. 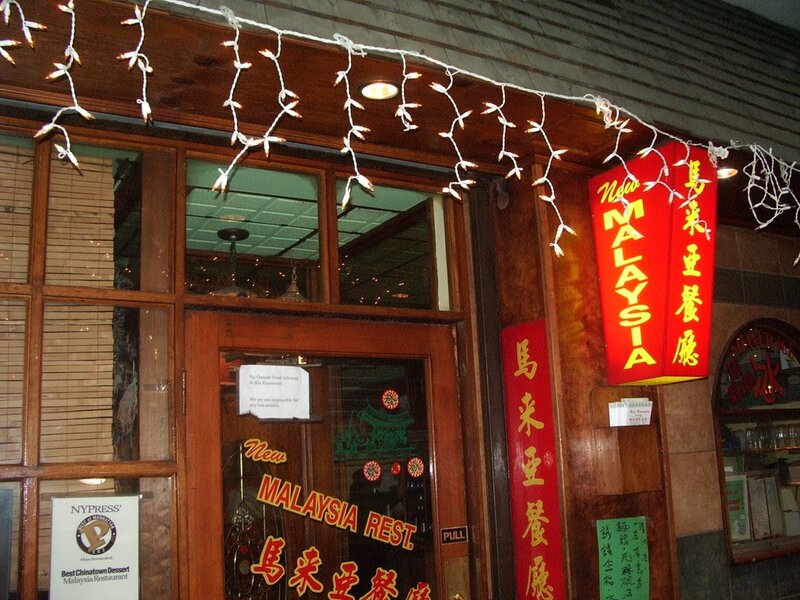 On my last trip here I shared the coconut cake and pumpkin pudding with Robyn. 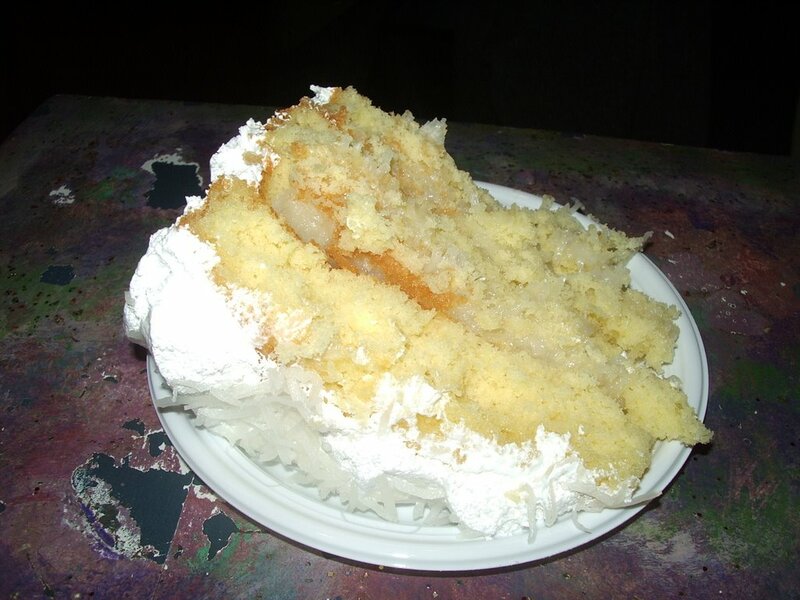 The cake was waaaay too sweet, but it was all easily forgiven in exchange for the moist soft texture and strong coconut flavor completed with mounds and mounds of shredded coconut flakes. But what I really loved was the pumpkin pudding. Remember this one, Robyn? It was so good that I even managed to finish it after our five course dinner at L’Ecole! Eggnog pudding, cream and pumpkin cake. I didn’t make out a distinct eggnog flavor in the pudding but the soft cold pudding combined with chunks of moist and nutty pumpkin cake called for a fall celebration in my mouth. Woohoo. Party indeed. All layered and moushed together like the banana pudding. I think it’s the texture that appeals to me – like bread pudding. And rice pudding. Oooh, pudding. Anything pudding. I love love it all! 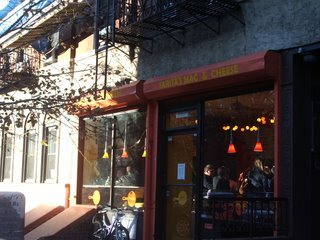 I headed back to Ingrid’s apartment later on the evening and we both walked up to S’Mac in the East Village. 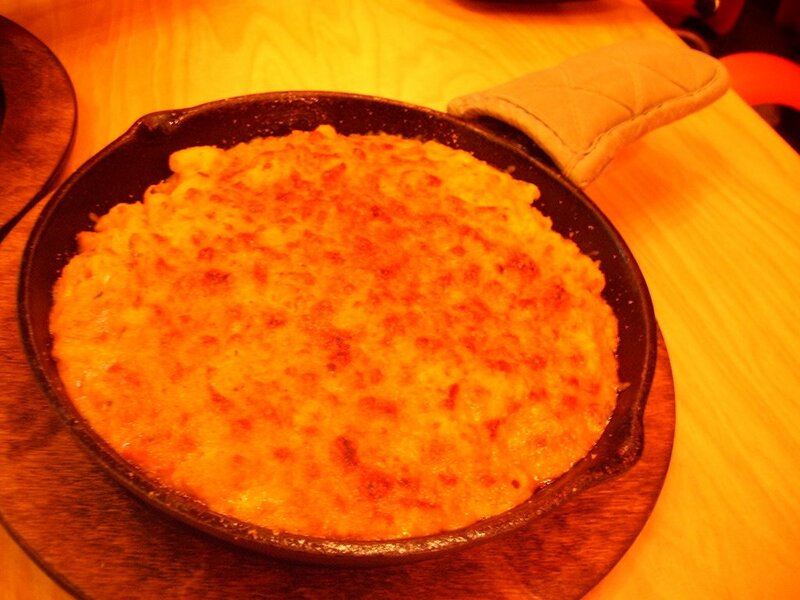 Though my love for mac ‘n cheese is not as extreme as my love for puddings, I do like it very very much. Sigh, is there anything I do not love? 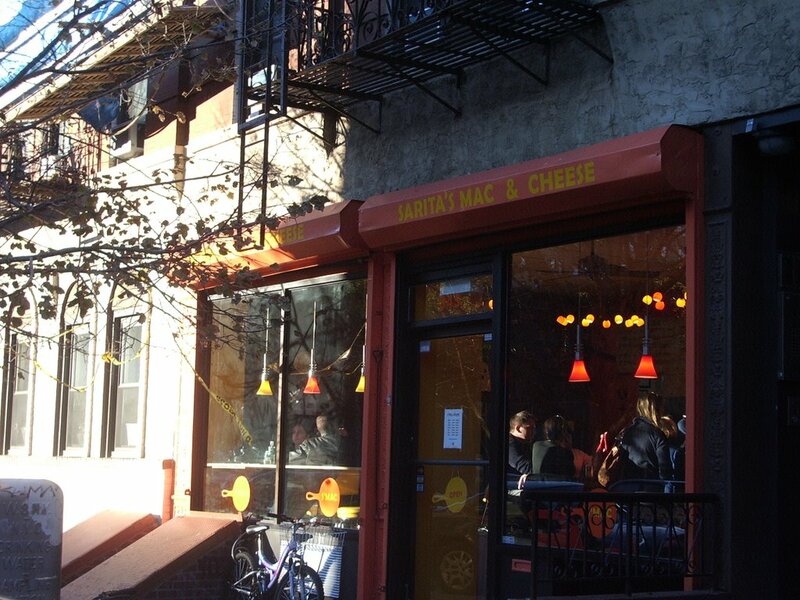 My first experience with mac ‘n cheese was freshman year at NYU. I lived in a triple with two other girls who were OBSESSED with Easy Mac. Like OBSESSED. It was crazy. I think they went though five or six Costco packs per semester. They lived on that stuff. And I admit, I partook in the occasional midnight indulgence of that stuff. Or morning breakfast. And I still eat Easy Mac every once in a while. Sniff. It’s actually quite good! Well getting back to the subject, mac ‘n cheese is the only menu item that S’Mac carries (if you don’t count drinks and mediocre looking cookies). It’s unassumingly tucked off 1st Ave on 12th St but the minute your get in, it’s serious sensory overload of the color orange. The whole restaurant is orange. Swimming in one shade. Hot Orange. 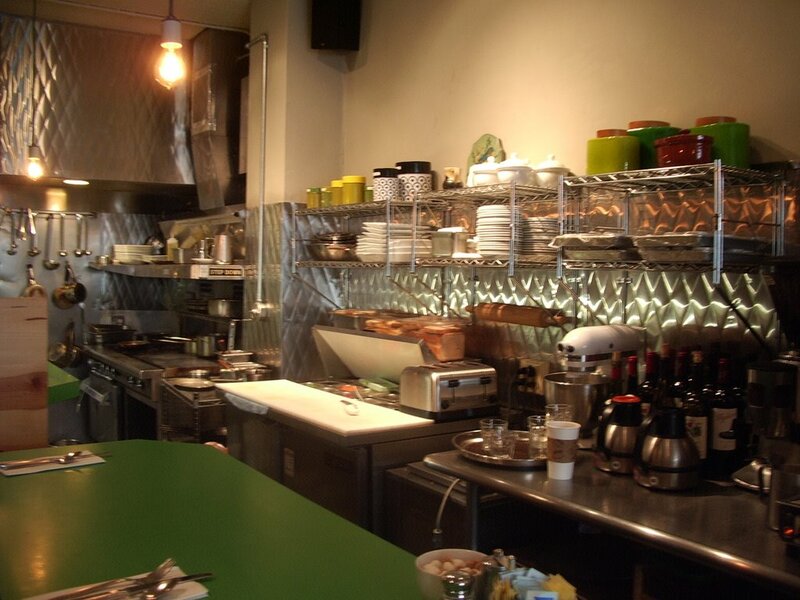 And with the open kitchen it’s HOT inside. You feel like you’re sitting in a furnace. Okay, maybe not that hot. But close enough. 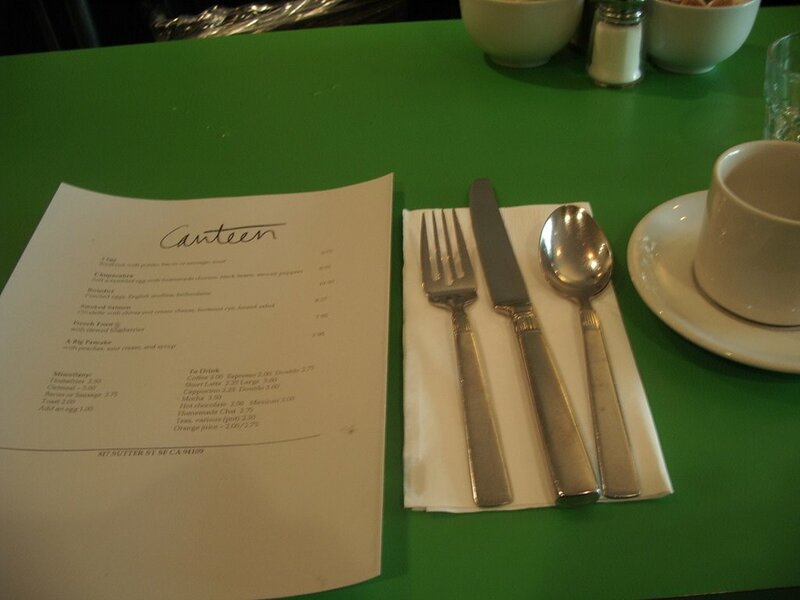 The menu is simple and straightforward. 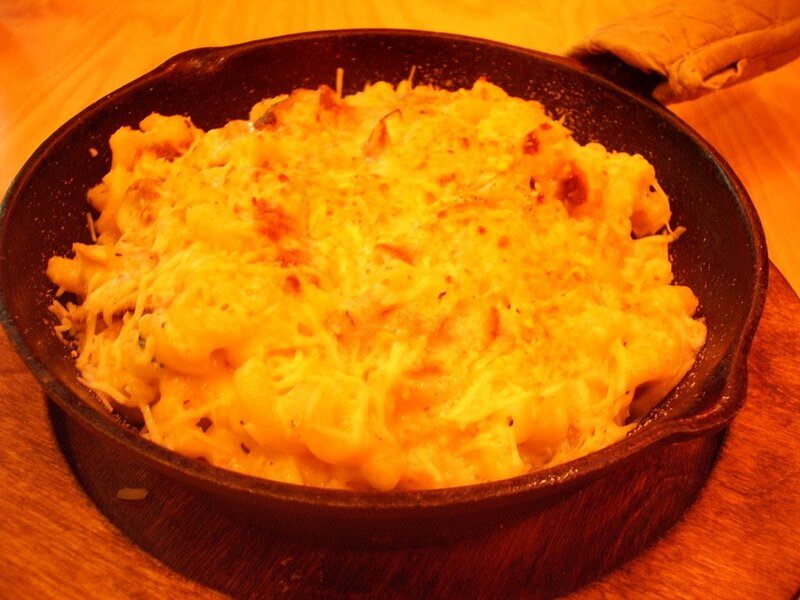 Ten versions of mac ‘n cheese with one monthly special. Or you can opt to make your own creation. Three sizes. Nosh, Major Munch, and Mongo. I’m sure the nosh can fill up most normal people, but we were in a hungry mood so Ingrid and I decided to split the Major Munches. Hear the tummies roar! But you know what was good? This one! The special of the month, the “Masala Mac” is “North American comfort food blended with Indian spices – exotic? mysterious? avant-garde? – you be the judge. This one is certainly not for the faint of heart!” I know, aren’t their descriptions SO cheesy. Oh boy, this was so good. Super cheesey and spicy. 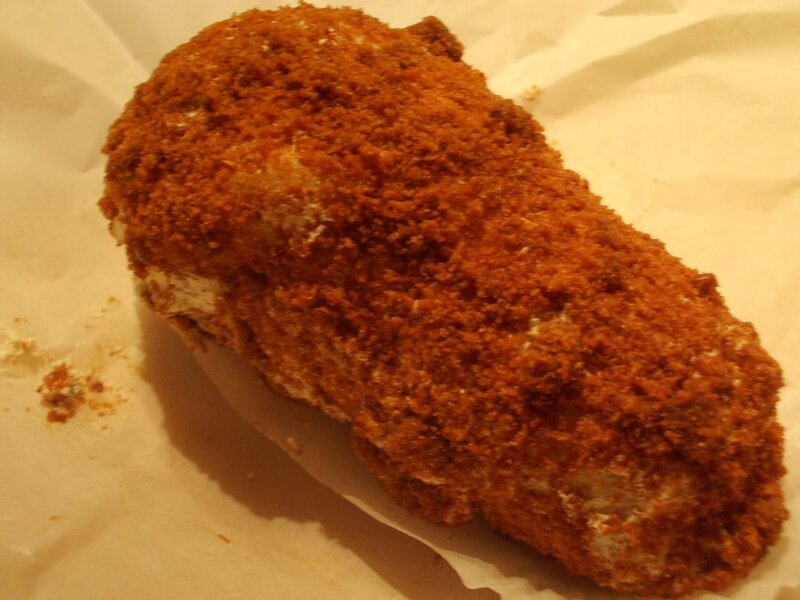 The crust was probably the best part – lots of breadcrumbs sprinkled on top (optional) and baked till crunchy. Every spoonful yielded rounds of macaroni blinded together by hot American and Cheddar laced with classic Indian spices. Yes, it was spicy. Yes it was so good. And even though I was full beyond words I keep on going, one tummy warming spoonful after another. Such satisfaction. No more Easy Mac for me. And that was NYC in a weekend! 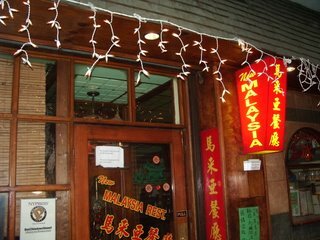 I bet you’re just as exhausted reading it all as I am by writing it :) I was glad I had a chance to return to some of my favorite haunts like BoKy (I dare you to find a better bowl of Chicken Curry Funn!) and City Bakery. One of my favorite things to do in the city is eat alone because you always end up sitting next to or talking to someone fascinating. It is as if every individual in New York has a passion or a story to share or tell. You never know how your day will end and begin. 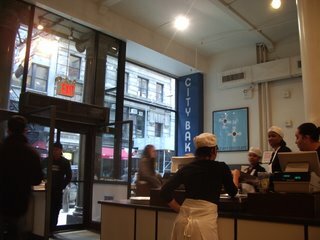 At City Bakery I started talking with man who collected antiques from weekend flea markets. He turned out to be an NYU professor and a close colleague of the only professor from NYU that I still keep in touch with. What are the odds? 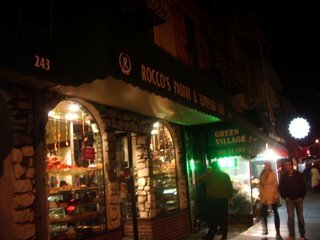 The lady who was in line behind me at Rocco’s on Saturday evening ended up being in front of me in line at City Bakery the next day. We must share the same taste in food. And the best part about Manhattan? You never ever have to drive! I went to sleep on Sunday with an almond croissant-less belly. It was a sad evening. I had searched fruitlessly all day for these creatures only to be turned down by one bakery after another. All sold out. But when Kathy wants pastries, she damn well gets them! Monday morning I bolted out of bed at 7am sharp, didn’t even both with contacts, much less brush my hair. I literally RAN the two miles to La Farine. I was going to GET THAT ALMOND CROISSANT. Am I slightly crazy? Perhaps. In love with food? Oh yeah. The bakery had just opened it’s doors and the warm cozy scent of fresh baked parties and bread was borderline intoxicating. I spied gorgeous morning buns – creatures of croissant dough dusted in cinnamon sugar, rolled and baked in muffin tins. To the left were Swiss Twinkies, puff pastry rolled in cigar/croissant-like style with a sweet nut puree. Brioches, big and small lay company to the golden apple croissants and soft mounds of tender orange scones. Talk about sensory overload. But I had only one object of affection in mind. 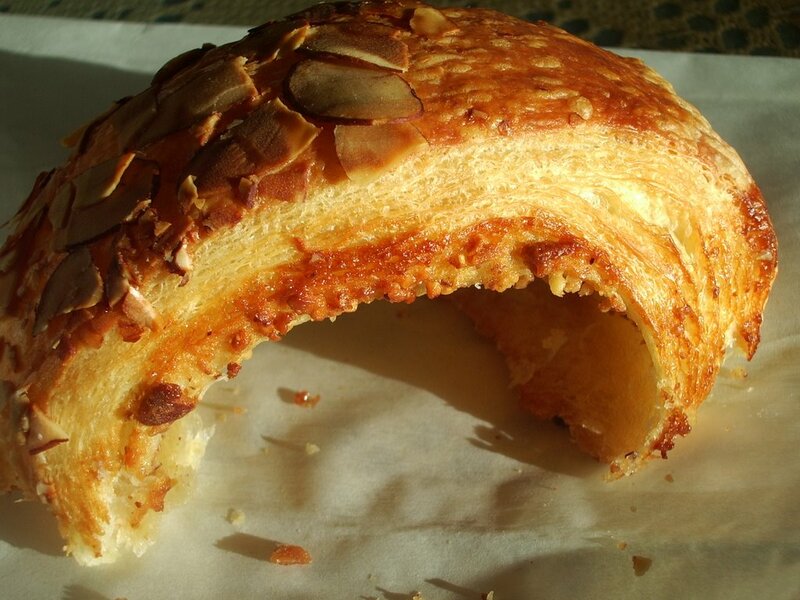 Almond Croissant. They sat next to the register in all their crisp brown glory. Rich as heaven and light as a feather. “One almond croissant please,” and it was mine. 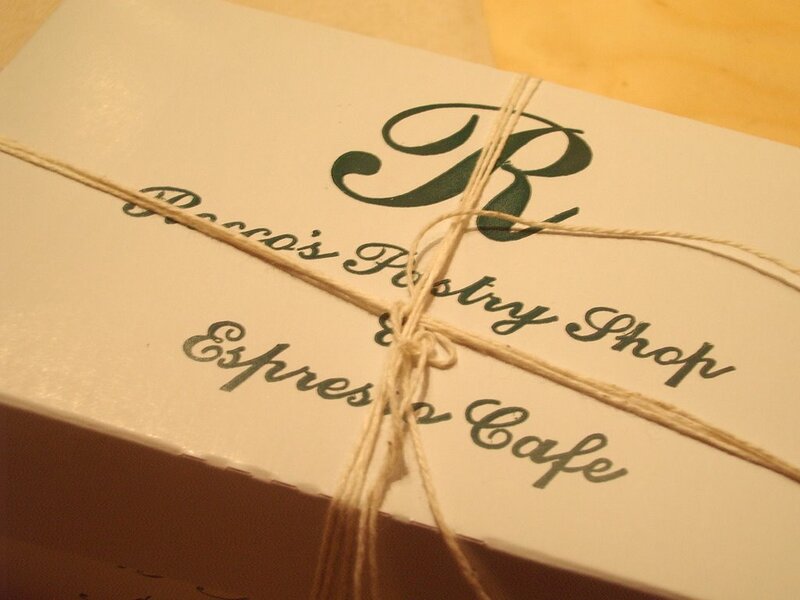 I took my dear pastry, carefully enclosed in a paper bag to the bakery’s single communal table. A swift rip of the bag, revealed all its natural beauty of butter, yeast, flour and almonds, a creature to behold. It resembled a snail in architecture and was perfectly browned from all angles and dotted with sliced almonds. Out at the base of the croissant lay some of the almond filling that oozed out but clung on, making for a wonderfully crunchy sweet reward. To beautiful to eat. Almost. I worked my way from the inside out, peeling apart seemingly endless layers of soft buttery dough twined with a nutty crunchy almond mix. It was not the traditional type of almond paste filling, but rather a rough mix of almonds, butter and sugar. Delightful, nonetheless. Bites at the top layer resulted in flying shards of crisp croissant flakes. Just as I like it. All at once soft and doughy with nibbles of almonds and a nearly flaky, properly crisp shell. I took bite and bite, nibble after nibble, till there was nothing left. It was quite fantastic; though I would be lying if I didn’t say I was the slightest bit let down. I hyped myself up so much for this one croissant. Everything from research of Berkeley croissants weeks in advanced, to being THISCLOSE to getting one at Masse’s and La Farine yesterday and everything else in between, built up my anticipation to the point where expectations were far too high to ever be satisfied. Silly me. This always happens. I often think about nothing but one dish or food item for days on end. 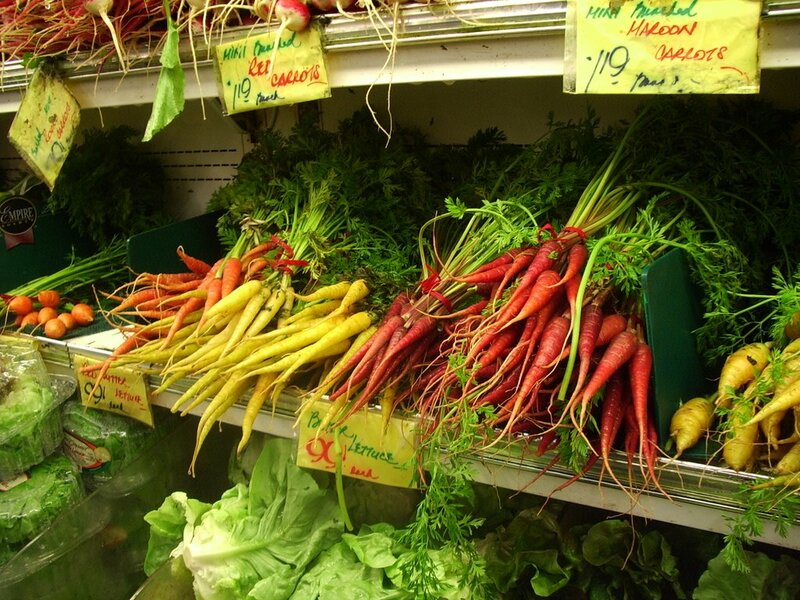 I build up wondrous ideas of it’s flavor, taste and appearance. And when I finally get it, it is good. But not as good as I had hope. Not nearly as good. But then again, food is rarely that excellent. Especially when you build up unreachable expectations. 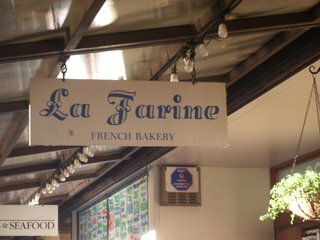 I suppose if I had come across La Farine’s croissants on a random morning walk, I would have been taken aback by its sheer simplicity and deliciousness. But because I had analyzed it left and right down to a science, there wasn’t too much to enjoy. I had asked for too much. I’m taking off to NYC tonight. TOP SECRECT MISSION. Will be back next Tuesday. I will not go crazy with food like I did during spring break (7 days, over $1000 spent, 9 pounds gained) and I will not research and make up crazy lists of things I HAVE to do HAVE to eat. Instead, I will come across little spots, encounter unexpected delights and bask in the beauty of it all. 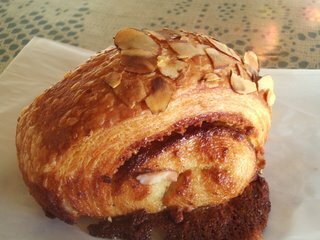 I did some research on almond croissants prior to coming up to Berkeley. You see, I have soft spot for croissants but recently I‘ve noticed that I’ll start to dreeeeam about them at random times. And not even about plain croissants, or chocolate croissants, but specifically ALMOND CROISSANTS. My cravings got so bad that during midterm-interview-presentation-hell-week, I dragged my dear roommate, Meg up at 5:30 so that we could get walk down to the local Some Crust Bakery right when it opened. My talks (and perhaps sleep talks) on the subject of almond croissants was enough to get her out of bed and walking in the dewy dark morning. 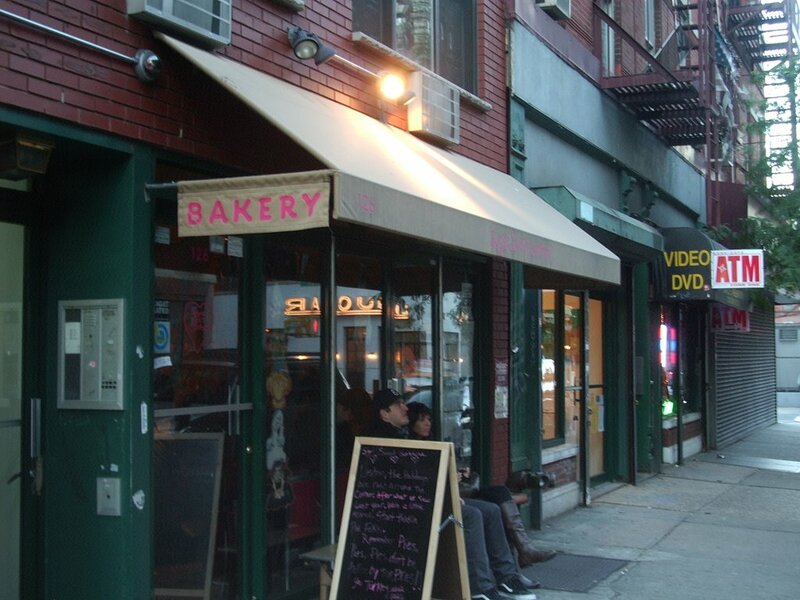 Some Crust is a very American bakery, and proudly so. 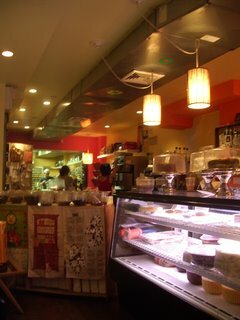 It’s boasts cookies, scones, muffins, in addition to danishes and numerous other rolls and twists. They also have croissants. They don’t try to make their croissants in the French manner – instead you’ll find a heavy, buttery dough. This is not bad. They intend to make it heavy and buttery But nor is it good. It actually makes me sad to a certain extent. Some Crust is why Americans are so fat. Everything is so BIG. SO excessively buttery. So overly SWEET. So wrong. But I come here anyways because, as you probably figured our from my complaining (hehe), food options in Claremont, CA are LIMITED without a car. 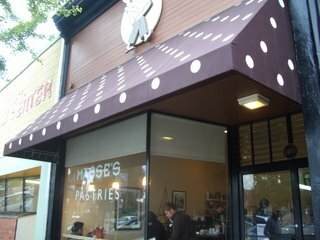 This is the only bakery within walking distance. How I survive with only one bakery, I do not know. But I get by. Don’t worry about me. Check out the chocolate croissant. It is a good croissant by average standards. A dark brown top, not quite flaky enough. Not shattering effect when you bit into it. 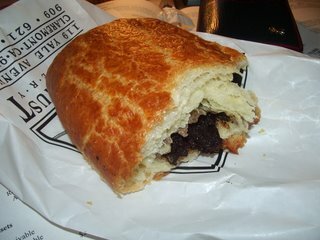 Layers of dough so heavily buttered that they seem to sink into one another till they meet at the middle in an oozy rich tube of dark chocolate. But if your expectations are set any higher than a good ol’ fatty American rendition of the French classic, you’ll leave disappointed. The almond is covered in ICING. Icing? What they heck is cookie icing doing on top of a croissant? Blashphemy! Same heavy limp dough with just a wee strand of almond paste. It was a sad sad discovery. Light years away from the discoveries Robyn has been making in Paris and beyond recognition from the creations on on C&Z. Their photographs make my tummy groooowl. After this under whelming experience at Some Crust, I started researching. Ok. Going to Berkeley. Will find AWESOME CROISSANTS. MUST FIND awesome croissants. So I chowhounded, food blogged-ed, googled. I came up with two names: La Farine and Masse’s Pastries. Ok, now fast forward. We’re in Berkeley, Sunday morning. The plan? 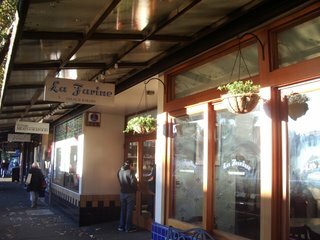 Early breakfast of almond croissants at Masse’s, followed by a visit to the Berkeley Bowl and then a midmorning breakfast of more almond croissants at La Farine. Christine and I got woke up around 7:30 in the morning, took our sweet time, cause I was on vacation after all and walked down to Masse’s on Shattuck. 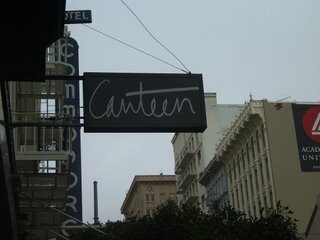 We entered through the doors at precisely 9 am, tummys about to burst with excitement, eyes wide open. Searching. Searching…searching…searching but not finding. 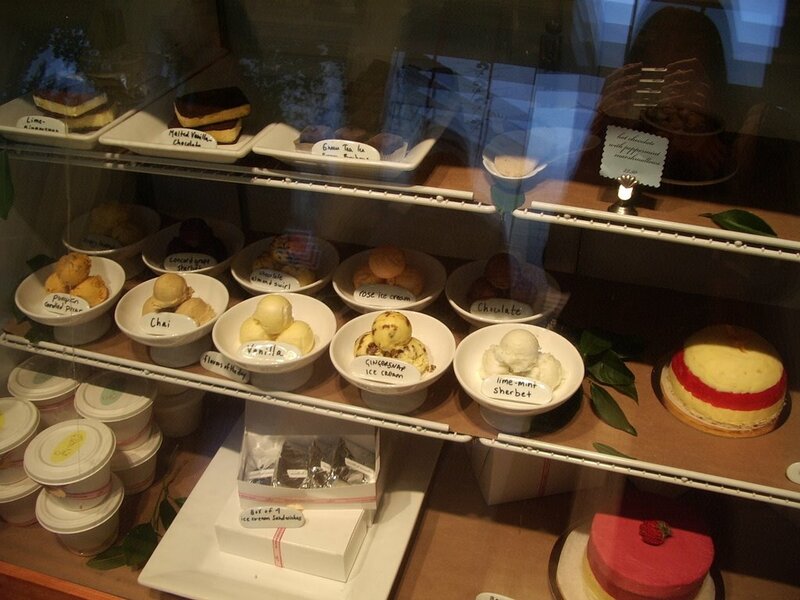 My eyes glazed over rows of beautiful pastries, plain croissants, brioches, butter roll, tart, cakes, pies. What? Where were the almond croissants? 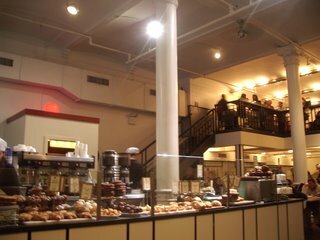 I donned my most hopefully smile and kindly inquired with the curly haired counter lady about the obvious lack of their famed almond croissants. “Next weekend?” What? why not tomorrow? I was leaving on Tuesday. “Oh. ok,” it was a mournful moment. 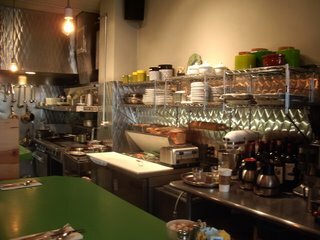 But you cannot be sad forever, so I took a seat at one of the four small tables, collected myself, reassured myself that one day I would be back here on an early weekend morning, then walked back up to the counter. 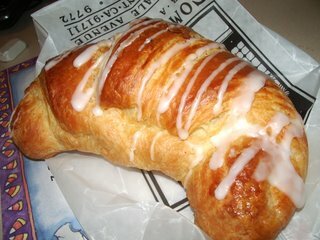 Almond croissant or no almond croissant, I was going to start off my day with a pastry! 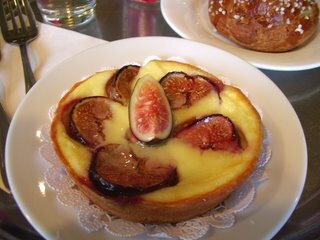 Any signs of distress over my lost croissant quickly whittled away at the sight of the Fig & Goat Cheese Brioche Tart. Heaven in five words? You bet. It’s like all my favorite foods were combined with the utmost care and baked to a sweet, savory, buttery round. The brioche dough was baked in a single sized tart pan, filled with rich goat cheese custard and topped by tender sweet figs, ready to melt at the touch of your tongue. The custard brioche was equally delightful. I mean, really, what’s not to like. 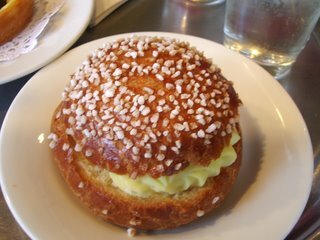 A brioche ball baked golden brown with spots of sugar sprinkles, split open and filled with an eggy sweet custard, a delightful mouthful. Rich in flavor, but light as bite of cool whip (you know you love that stuff! – as a kid at least :)). The contrasting textures of buttery baked dough and vanilla scented custard made it so that this treat could have been offered as a dessert in any restaurant with great applause. I was quite content with my breakfast (despite the fact that they sold out of the almond croissants just ONE HOUR after opening) I walked back along Shattuck, stopped by a bookstore to purchase a used copy of Schott’s Food & Drink Miscellany (will tell you about it after I find time to read it – should be on college assigned reading lists! ), then walked and walked. Ho boy, my feet were tired. Anyhow, I was almost there. And too cheap to take the bus. 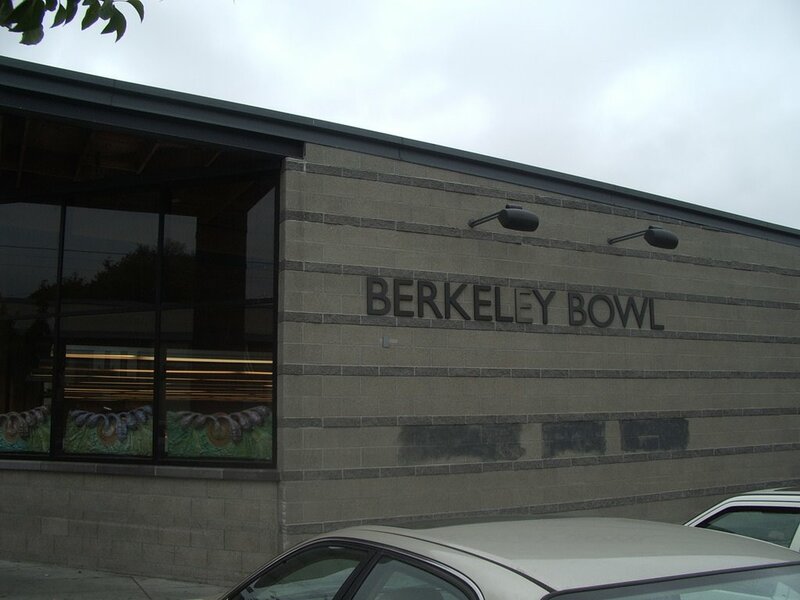 Soon enough, the grand Berkeley Bowl was in sight. Tadah! 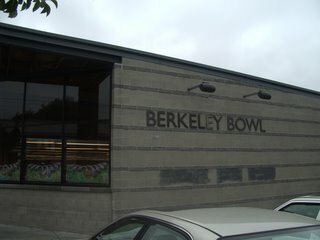 It doesn’t look like much from the outside, but think of it as Berkeley’s version of NYC’s Fairway Market. 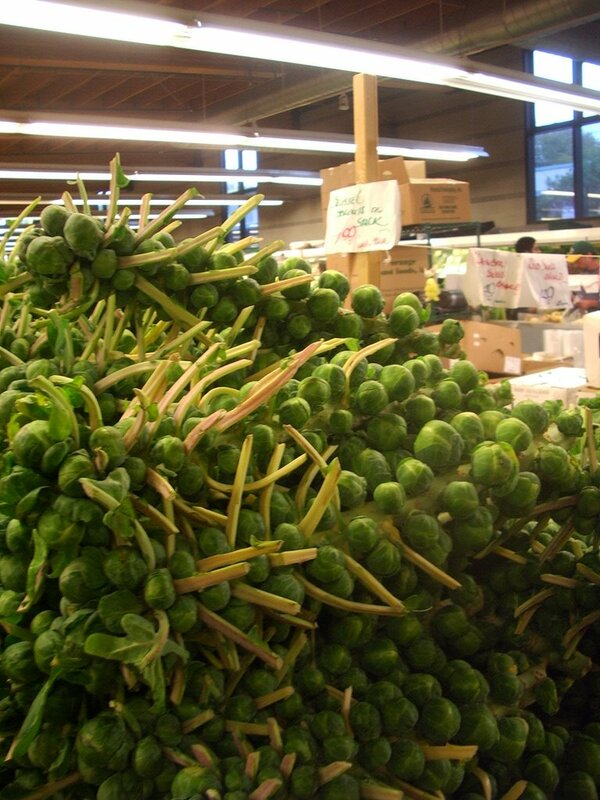 Only with a better produce section. And Acme bread. 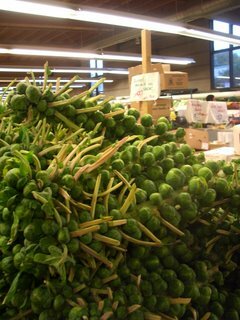 I’ve never seen Brussels sprouts sold like this before! 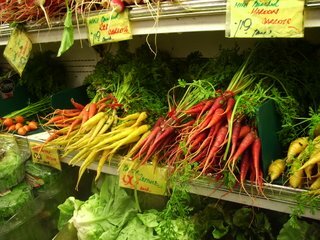 I didn’t buy too much, knowing that it was a long walk from Berkeley Bowl to La Farine (VERY long walk). Just some dark chocolates and three packages of McVities Digestive Biscuits. I’m addicted to these and have no explanation. It is just so. And they are so damn good. I’ll pass out if I have to go a day without them. Sigh. Woe is me. Biscuits can add up to be a remarkably expensive habit. Haha, guess what? Want to know what happened when I got to La Farine? I didn’t know whether to burst into teats or laugh. So I did both. I think the guy behind the counter thought I was psycho. If only he had known…if only! He was kind enough to tell me that they don’t usually sell out an hour after opening (like Masse’s), but approximately four hours after opening. Chee. People in Berkeley really do like their croissants. I was defeated. For today at least. Check back tomorrow. Kathy gets her almond croissant in the end! Ooooh yea. You betcha she gets that croissant! Last Monday I scrambled out of bed bright and early to catch the BART into San Francisco. My object of desire? Canteen’s breakfast of Chupacabra, a dish oft spoken of with high regard on Chowhound. I exited at Union Square, dashed past Macy’s, the new Westfield mall, this and that hotel, cabs on the street and the beautiful morning dew. A left turn onto Sutter Street, a couple blocks down. And there! Awesome, I was the first guest of the morning. “Oh, they’re both good!” and she strolls off towards the register to enjoy her cup of coffee. Great. I was going nowhere. See what happens is, I usually get sweet dishes for breakfast – think pancakes, french toast and the like. And then someone else at the table would get something savory. And then I get a severe case of “order envy” in which I stare longing at their savory hot dish wondering why I stupidly choose the sugar-laced starch. It’s not that I don’t like my pancakes and toast, it’s that I want my order AND theirs! Gee, I’m a greedy bum. :) But today would be different, I will restrain myself from letting my evil sugary side takeover. Chupacabra it will be! I placed my order with the utmost confidence and relaxed back, happy with my decision. There were three of us in the small restaurant at the moment. The waitress, the cook, and I. Everyone seemed involved in their own world. The waitress confirming dinner reservations, the cook in the open kitchen, hunched over on my softly scrambled eggs and myself, observing what the other two were doing. Ten minutes later it came. Presented by the cook himself, nonetheless! My Chupacabra Isn’t it gorgeous? A bed of savory hot homemade chorizo stirred in with black beans. 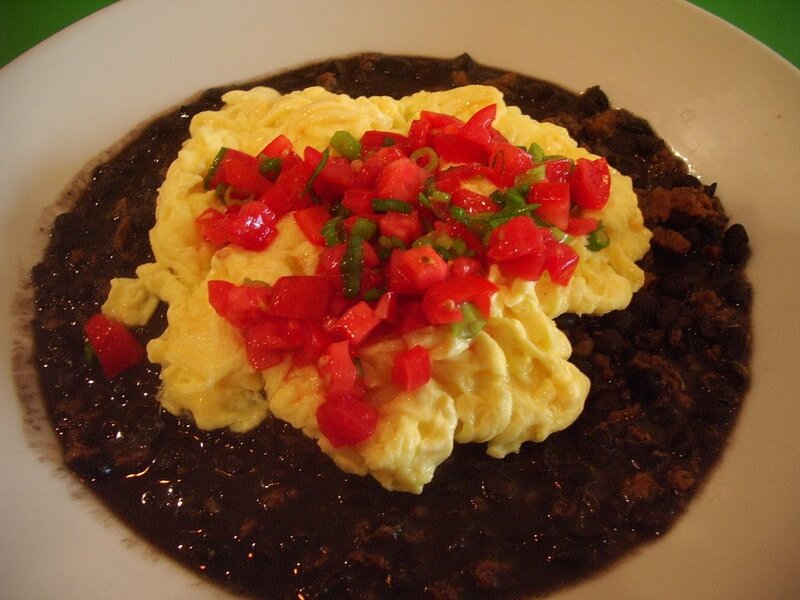 Beneath the blanket of just barely scrambled eggs laid a mound of spiced stewed peppers. I didn’t know where to begin so I took it all in at once. Hoooo man, it was joy in a mouthful, the tender chunks of pork marked by the almost nutty beans and soft eggs, dark red peppers, touches of diced tomatoes and green onions – I would have given anything for a couple of fresh tortillas to soak it all up. All was silent in the kitchen/restaurant as I enjoyed this dish, I would have moaned from gastronomic pleasure…only I think the waitress would have found that inappropriate, so I substituted my appreciation with, “mmmm, this is soooo awesome!” (I must have sounded like a cheerleader. woohoo!) Hearty and comforting in ways that only proper food can be, my Chupacabra was the perfect match for this dewy San Fanscico morning. It appears as if Alice Walters has extended her arm over yet another part of the East Bay. 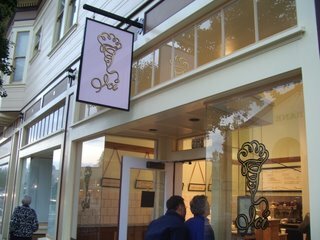 It is as if every restaurant in Berkeley is somehow connected to her in one way or another. Recently opened by a Chez Panisse alum, Ici is the new ice cream hot spot in town. 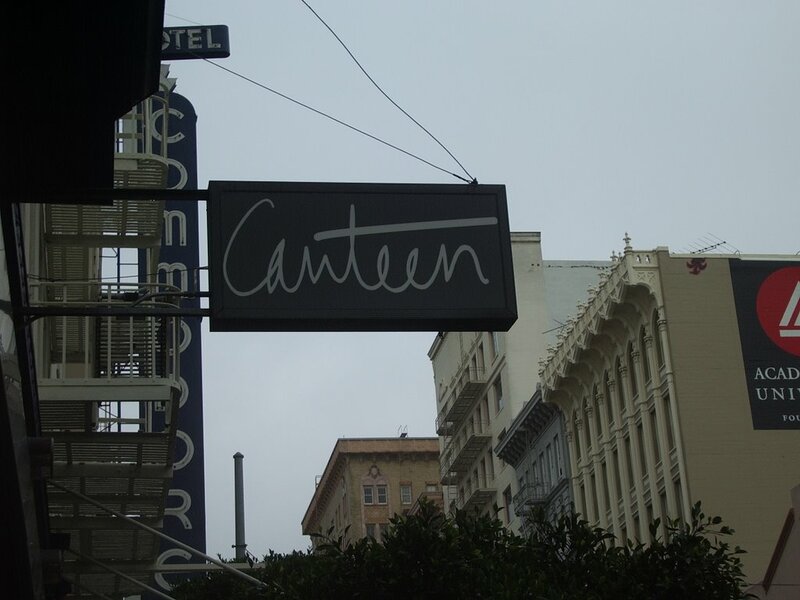 Nestled between eateries along College Avenue, it’s just skip, step and long uphill walk from UC Berkeley. 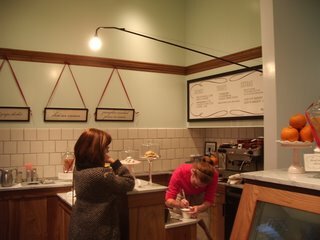 Imagine a subdued, high end Magnolia Bakery in terms of decor with soft homey shades of pink and woodsy pictures frames along the walls. The shop was not very busy when I arrive around 7 in the evening, but many people were popping their heads in with the “hmmm, is this a new place?” and then recoiling in slight shock when they see the price in comparision to the portion sizes. hehe. Oh we Americans. Why must everything be so BIG? Flavors change daily and they all sound quite decadent from the Blue Bottle Espresso to Black Mission Fig and even a Coffee-Cardamom. There’s also bitty ice cream sandwiches if you so desire – a weentisy size (60% the size of a deck of cards) for the $4.50 price tag, though adorable nonetheless. 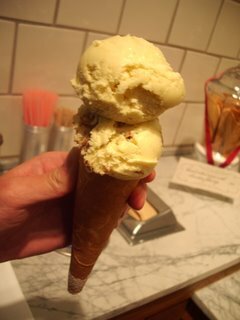 After much sampling and indecision, I carefully selected a scoop of the Honey Lavender and the Pumpkin Gingersnap in a cone. And what good decisions I made! Both ice creams were soft almost to the point of buttery. So smooth and full of pure honey flavor. The lavender was lost somewhere between and the treat as a whole was just a tad sweet. But everything tasted so simple and honest. Just the bare minimum. 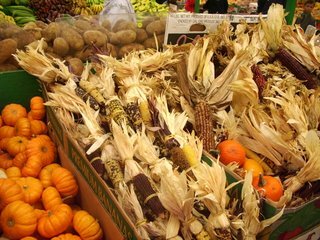 The Pumpkin reminded me of an October autumn of earthy scents studded with crumbled gingersnap cookies. But wait! 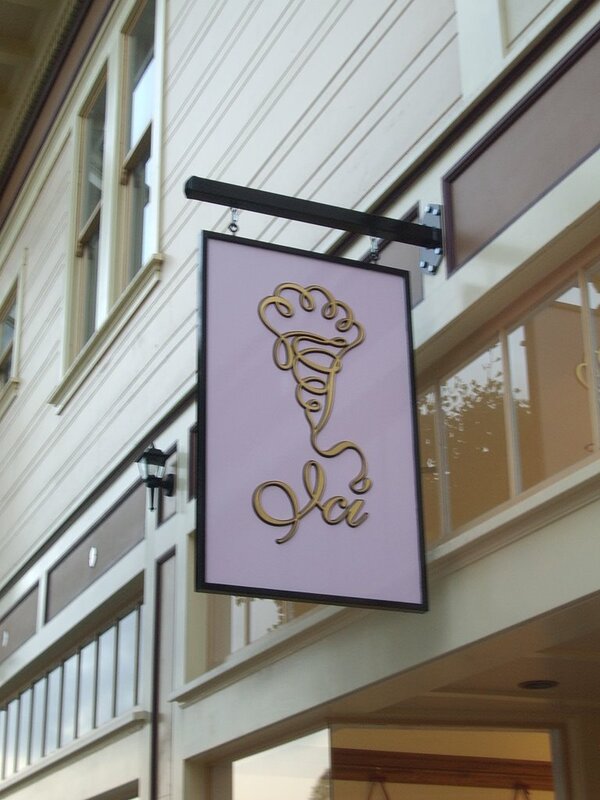 The ice cream was good, very good. 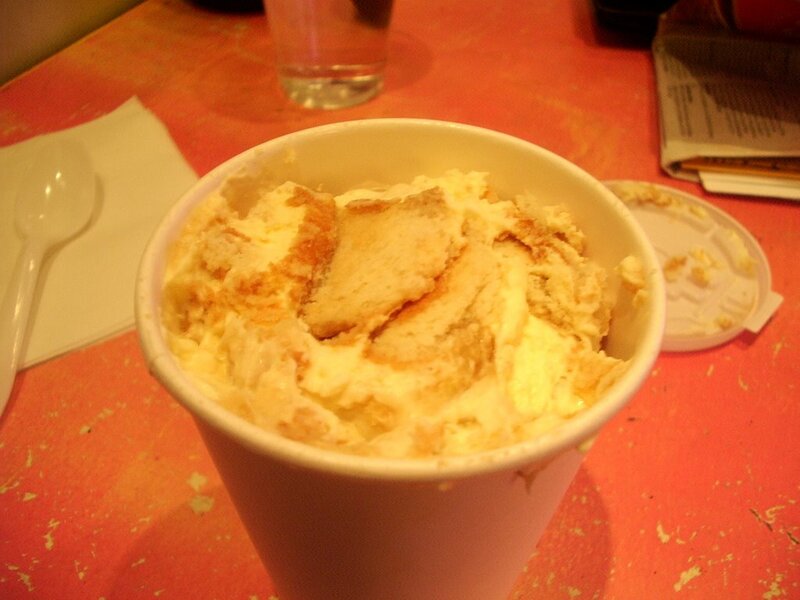 However, not nearly as enrapturing as Batali’s Olive Oil Gelato (I’ve yet to find a more addictive flavor). 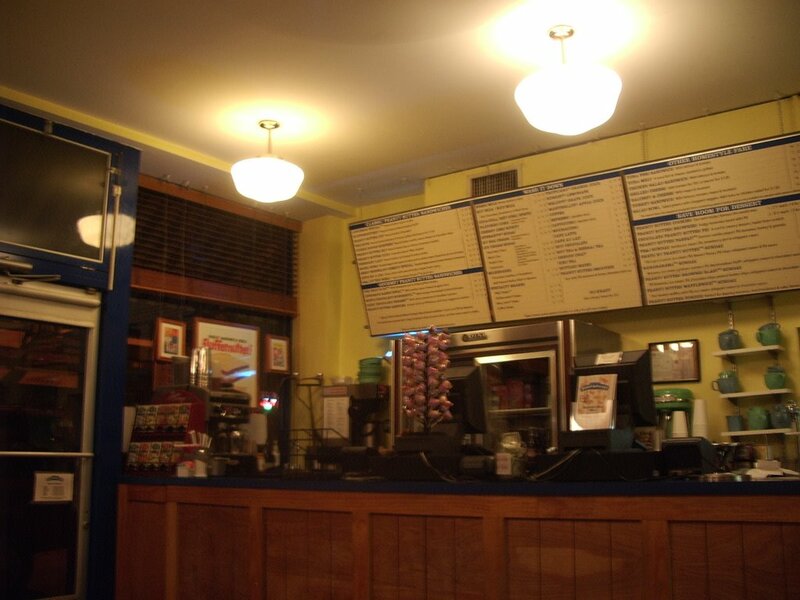 What you SHOULD come back here for is their ICE CREAM COOOONES. Yes. The CONES! They are amazing. Incredible. Golden butterfly wings of crunchy sugar, light and delicate, practically see-thru-thin. They are long and elegant, like the arm length white cashmere gloves I’ve been eyeing at Barney’s for far too long. The tip is dusted is sugar and at the very bottom of the inside is a tiny nugget of melted dark chocolate. Oh so bitter and just perfect. I felt as if I would break the cone just by holding it – three layers had to be spun around in increasing heights for the wafer-like cone to maintain it’s ice cream holding integrity! My only irk about this place is that there’s no place to sit! 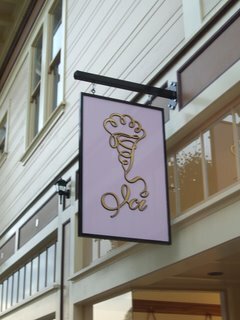 Don’t people like to settle their okole’s down when enjoying a $5 cone of ice cream? Ice cream can get messy. Maybe I’ll just have a $.50 cone next time. I would be just as content. Or maybe it will take two cones to make me content. Oh heck, they sell it by bags of ten. I’ll have ONE bag.